to the Crop Pattern Phenomenon? The article below was published in the Dream Network Journal in 1992 (Volume 11, No. 4). The Editorial Preface was written by Roberta Ossana, M.A. I have made some minor changes in the published article, as there were a few mistakes. The version on this page is closer to the original article that I submitted. I have also added appropriate links. A Postscript has also been added. In early July, I went to the Post Office to do a mailing and pick up a package. When the woman behind the counter approached me with a very large and weighty manila envelope, I had the immediate and distinct impression that she was handing me a newborn baby. In fact, in reading through the materials in that packet, I became aware that what was being revealed through this person's experience may be the birthing of a new and potentially powerful new area exceptionally worthy of our attention. In the reading process, I was stimulated to recall, then review, one of my own current dreams that held a direct connection to the materials Joe Mason had sent. What followed that connection, though too lengthy to go into at this time, put me directly in touch with the spirit and magic that is at work in this world all the time, if we but take the time to notice. To him, I am grateful. Be aware that what you read here is the synthesis of what was perhaps a two pound (baby) packet in its original form. I would like to congratulate and commend the author for his success in summarizing what has been, for him, a series of non-stop knock-out experiences, dreams, synchronicities and studies over the past two years. He is an electrician by trade and prior to the experiences in this account, he had little knowledge of crop circles or mythology, though he had been paying attention to his dreams since 1976. Prior to making contact with us, he had written extensively to the Crop Circles investigators in England as well as to other publications,seeking validation for and interest in his experience and subsequent insights. He does not consider himself a writer, though he has done a very good job of presenting his experience, questions and requests. Like many, I had seen and read a little about the Crop Circles and was intrigued. The phenomenon has apparently not been too newsworthy. However, Joe shared with me a film that had been done in England by the scientists who have dedicated over ten years to studying the Crop Circles which confirms: 1) Science cannot prove a cause, purpose or solution to the mystery of the circles/patterns; 2) The two individuals who claimed to have 'hoaxed' the circles - though they received considerable international press coverage - were easily discredited; and 3) Science and countless others who have been drawn to this phenomenon, seem to agree that the crop patterns, which have been appearing around the world (but most predominantly in England) are a mystery, are not being created by the human species and in fact may represent "the intersection between this reality and a world we know very little about." Colin Andrews, scientist and crop circle investigator for 10 years said: "It's as though we are on an evolutionary cycle; it's as though we are being taught to do something." Reality changed abruptly for me about two years ago. An intense period of dreaming started about the same time I became interested in myths and crop circles. I began to ask others about their dreams. Coincidences happened constantly, as if to confirm that it was all inter-related. Evidence is growing that dreams and crop circles are communicating a message about a great change coming and it is shedding new light on mythology. By relating a few brief examples here, I hope to inspire others to pursue the subject. The strangest example involved a mathematical, computer-generated shape called the Mandelbrot Set (B). I began writing of its spiritual symbolism in mid 1990. It is an odd concept, but the symbol analogies just fit well. I was in awe when I read that the Mandelbrot Set appeared as a crop pattern in 1991! (2) It was about the last thing I expected. I stripped a red thermocouple wire and then kissed a pretty, dark-haired woman. I then stripped the white thermocouple wire and kissed a pretty blond. Within hours, my son called and told me had had a dream of trying to push two women together into one. I realized that a thermocouple becomes a generator of electrical power when the red and white wires are bonded together at the end. People had another person who was part of them. The other danced with a partner. Someone was saying "See, they can interact and still be part of you". I knew it was similar to electron interaction, like a do-si-do square dance. In early 1991, I read The Sacred Symbols of Mu. (4) It shows ancient symbols from around the world. There is a "T"-shape, called the Tau. Two trees are sometimes depicted above each arm of the "T" with a flower between them. I felt that a tree symbolised knowledge or beliefs, which become life, or the reality. This was reinforced when a friend told me a dream in which he saw a tree with some rotten branches growing out of his son's head. He started to prune the rotten branches but knew that if he pruned to deeply, it would kill the boy. The Tau is sometimes depicted as a split-trunk tree with three branches at each end. From the puppet-pair dream and the "T" association, I felt the two trees on the Tau represented two ways to knowledge - rational and intuitional - the former being symbolically masculine and the latter feminine. As I gathered more information about the crop circles, I saw other connections. In 1990 a group of people saw two apple trees in an orchard shaking violently. They found a half ring formed in the field next to the trees. (6) In 1991 several patterns appeared that had Tau-like shapes (C, D & E). The first one (C) is said to be the Irmensul, the ancient German tree of life (7) . It reminded me of a Gnostic account saying that one's world is like the womb, with the placenta as the Garden of Eden. The second one (D), I felt, might be related to a message I heard in a dream: "I'm stretching out my limb in order for you to watch it grow." I came to see a bicycle or motorcycle as a dream symbol for a balanced condition. For example, a recently divorced woman dreamed of riding a unicycle precariously, while others rode bicycles. They could be a before-and-after representation of the increasing feminine aspect. The central circle is like ancient glyphs of the duality, or Mother/Father Deity. (4) The ancients said that the Deity is One but manifests as two. The glyph for the Monotheistic Deity is a single circle or a circle with ring. These are frequent crop patterns. After I saw the Barbury Castle pictogram (H), I realized that quite a few of my dreams and experiences seemed related to it. Because of space limitations, I'll just mention a few. I saw a "Y"-shape that was also a woman's body where the legs meet. Three energy lines moved from the center, two outward and one downward. Then I saw it again but this time there were just the two outward energy lines. As I saw this, a voice said: "Some say there are three ways of unfolding the world. We say two." The pictogram had a "Y"-shape within it. The wheat stalks were laid out from the center. (9) I found an ancient glyph that resembles the pictogram of a circle with a ring inside a triangle. (4) It was said to represent the Deity in Heaven. The text went on to say that the ancient Chinese equivalent was a "Y"-shape, called "the Great Term" or the "Great Unite". It meant that all things with form came from that which has no form. The eye in the triangle is said to be the Deity looking out from Heaven. A triangle with the letters AUM at the corners is said to mean "the Father and Mother engendered the Son, Man". It seemed that the pictogram might also be about the duality balance. Two days before seeing it, I dreamed of people being told about being out of balance, or offset; to look for offset circles. The central circle and rings in the pitcogram were indeed offset. I thought it could also be about the Trinity and the virgin birth. 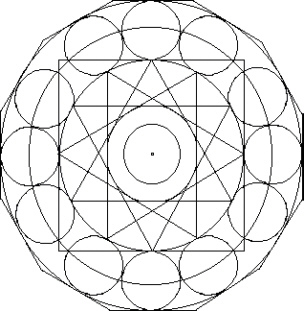 The circles at the corners might represent the Father Deity aspect, the Mother Deity aspect or Holy Spirit and the engendered Son, Man. The square footage of all the circles in the pictogram added to 31680 which is said to be a number associated with Jesus by early Christians. Some months after I saw the Barbury pictogram, a string of three stories seemed to come to me that contained trinity or Christ symbolism. In each one a miraculous event happened, such as great strength. Then I saw a book about medieval knights and their battles. (10) I remembered reading of the incredible battle of Agincourt, where the English soundly defeated the French, while being vastly outnumbered. I looked up the story to see if it had any trinity symbolism. I was astonished to see that the banner of the Holy Trinity was carried by King Henry V into the battle of Agincourt, and the design was very similar to the Barbury Castle pictogram. (I) It was quite a coincidence. Another message of the crop circles and dreams may be about world unity. I had a dream of an electrical splice box with the wires disconnected (J). I felt that it meant that people were not connected. 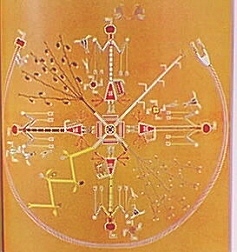 Later I saw Navaho sand paintings that looked similar (K) . I speculated that the quintuplet set of crop circles (M) could symbolize carbon, the basis of life, with its four bonding electrons. This was an analogy of human evolution where diamond (unity) is the final stage. Carbon can take various forms, such as graphite or coal, depending on how the electrons bond. Under great heat and pressure, it bonds in the most ideal way in terms of strength, forming diamond, the hardest substance. Each bonding point has a plus and minus charge, suggesting a duality bonding. The quintuplet set also hints at a pyramid from above (N). I've been told that diamond forms in pyramidal shapes. Symbolically, the great heat and pressure is the stress and challenge here, now, in the cycle of time, that leads to unity, or human bonding. An article about patterns found by dowsing in crop circles and megalithic sites shows one with 12 circles in a ring with a 12-pointed star inside, formed by four overlapping triangles. (15) It is called The New Jerusalem Plan and it is based on the vision of St. John in Revelation 21. It is said to represent the order of the Heavens made apparent on Earth. As I am not a conventional Christian, I was quite surprised, because it seemed to match my dream experience. After seeing that a Teutonic Cross was found by dowsing in a crop circle, I realized that the New Jerusalem Star could be derived from the quintuplet set by sliding the triangles of the overhead pyramid to overlap. A coincidence soon followed when I read a little pamphlet from a group called Solara 11:11. They teach that the Key to the great change is to form star mandalas of overlapping triangles. The drawing was based on my interlocking ring dream and a similar dream where circular arcs forms a camera-like aperture. Using four Barbury triangular shapes in my sliding triangle idea reveals the New Jerusalem Plan from the quintuplet set (Q, R, S). It reinforces the diamond analogy. Coincidentally, a few weeks after drawing the shape, I found a Navaho sand painting with a shape in the center similar to my Barbury quintuplet. (17) Around it are the four gods of the directions holding "Y" shaped symbols. Recently, I found a possible connection to the story of Noah's Ark. Four couples were aboard the ark. I wondered if this was related symbolically to the sand paintings. I read the story and was startled when I came to Genesis 8:4. The ark came to rest on the mountains of Ararat on the 17th day of the 7th month. The Barbury Castle pictogram appeared on July 17th, 1991! Another coincidence. The number nine is said to be a Goddess number. (18) In India 108 is the number of names associated with the Goddess. (1+0+8= 9) Three circles (like in the Barbury pattern) times 36 equal 108. (360 degrees in a circle). Twelve circles times 36 equals 432, a cycle of time number. (4+3+2=9) and (3+6=9). Perhaps this is another hint that we are nearing the end of a great cycle. Joe Mason is an electrician and has been interested in dreams and esoteric subjects for many years. This is his first published writing. His life was fairly normal prior to recent events. Since writing the above article about eight years ago, much has happened. In some ways the article was predictive of crop formations yet to appear. For example, the Bythorn Mandala formation appeared in August, 1993. It was flower-like with a star inside and was based on interlocking circles in a ring. Many other interlocking ring type formations have appeared, including six-fold and twelve-fold types. One theory is that many formations of this type are related to the chakra system. Another section of the site is Code of the Ancients, which includes the prehistoric number system, now thought by some to be manifesting in the crop circle phenomenon (see Part Seven). Some of the numbers mentioned in the above article, including 432 and 31680, were part of the ancient system, which some call the most ancient form of Gematria. The "11:11" coincidence mentioned in the article led eventually to Revelation 11:11. The meaning became clear - humanity has been on a time cycle path that corresponds to the chakra levels. We are near the 3 1/2 midpoint and a leap to the fourth-heart chakra level of consciousness evolution. Many other people are reporting strange coincidences involving 11:11. Diagram Q (above) evolved, as I found that it matches the Four Living Creatures of Ezekiel and Revelation when the four "wheels" are drawn in. In diagram Q, I left out the wheels, which are patterned after the central circle and rings in the Barbury Castle formation (H). The same four triangles, remember, can be arranged like The New Jerusalem Plan. It is similar to diagrams of the Zodiac and to the symbol of the heart chakra. The Four Living Creatures, I found, trace back to the camp positions of the twelve Tribes in Numbers 2. The four major Tribes correspond to the Living Creatures, and to the Zodiac signs of the solstices and equinoxes during the Age of Taurus. In each quarter is a major Tribe and two other Tribes, for a total of twelve Tribes. In the center of the encampment is the Tabernacle. The camp arrangement is a reflection of "heaven," that is, the circle of Zodiac signs in the sky above. It is probably not a meaningless coincidence that The Tree of Life appeared as a crop circle formation in 1997, or that the Menorah appeared as a formation in 1999. The Tree of Life stands in the center of The New Jerusalem in Revelation 22:2. The Menorah, the lampstand with seven lamps, is in the Tabernacle. The son of man stands in the midst of the seven lampstands in Revelation 1:12, 13. The two olive trees, the two anointed, stand on each side of the Menorah in Zechariah 4, and stand up after 3 1/2 days of being dead in Revelation 11:11.